Doors 6:30 p.m., Films 7:00 p.m.
We will be hosting a gathering before hand at the Saco River Brewery (5-6:30). Food and drink available. 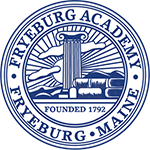 Proceeds will go to Fryeburg Academy outdoor programming.